Loretta Lynch testifies during a confirmation hearing before the Senate Judiciary Committee regarding her nomination as U.S. attorney general Jan. 28, 2015, on Capitol Hill in Washington, D.C.
Today is Monday, April 13, 2015. Unlike any other humdrum, “I wish every week were a three-day holiday” Monday, this Monday might be forever remembered as one of the most politically and culturally important days in the history of the United States. As a result of the U.S. Senate’s pandering to the right wing of the Republican Party, delaying a full Senate vote on the confirmation of Loretta Lynch as the next attorney general of the United States, this day could forever elevate the status of women, African Americans, Latinos, Asians, members of the LGBT community and any other community that is neither white, male nor Anglo-Saxon. Today is the day after Hillary Rodham Clinton announced her bid for the presidency of the United States of America, declaring, “Everyday Americans need a champion, and I want to be that champion.” If elected, Clinton—wife, mother, grandmother, advocate for women and children, former first lady of the United States, former U.S. Senator and former secretary of state—would become our nation’s first female president. Today is the 156th day since President Barack Obama, our nation’s first African-American president, nominated Loretta Lynch to succeed Eric Holder as the 83rd attorney general of the United States. 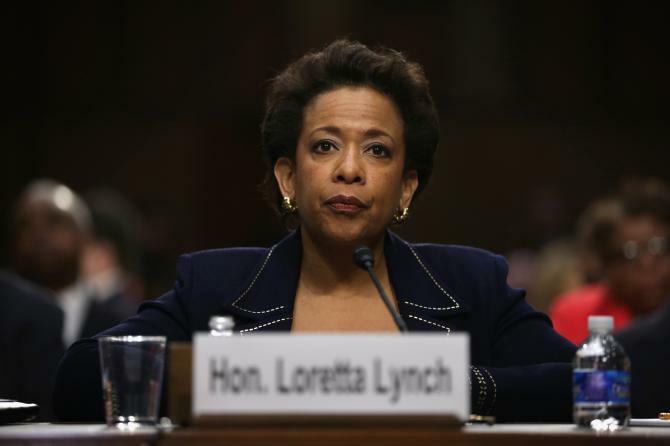 If confirmed, Lynch—wife, stepmother, reported aficionado of Chaucer, Harvard College and Harvard Law graduate, former white-shoe law firm partner, former board member of the Federal Reserve Bank of New York, and current U.S. attorney for the Eastern District of New York—would become the first African-American woman in our nation’s history to take on the role of America’s chief law-enforcement officer and lead the U.S. Department of Justice. She would be only the second woman to do so, taking office some 22 years after former Attorney General Janet Reno did so. The reasons behind the delay of a full Senate vote may very well be the death knell of today’s Republican Party. As many demand an explanation for this unprecedented delay, Lynch’s opponents say this has nothing to do with her race or gender, despite those who have questioned if the Senate’s inaction is a direct result of racism, sexism or both within the ranks of the Republican-led body. Some 156 days after President Obama nominated Loretta Lynch to be the nation’s next attorney general, these seemingly benign sentiments by some Republicans tell the rest of the nation that the delay in scheduling a full Senate vote on the Lynch nomination is a direct result of what looks and feels like the most extreme, right-wing members of the Republican Party’s disdain for President Obama, their never ending obsession with controlling women’s reproductive rights and, among other things, their inability to wean themselves thoroughly from the anti-immigrant, anti-Latino, anti-black and anti-women elements of their party. In their blind devotion to saying no to all-things-Obama, members of the right wing have proven yet again that they are willing to sacrifice the health and well-being of our democratic system to draw blood from their commander in chief as he prepares to leave the White House in just two very short years. But in bludgeoning Obama, they also bloody the republic, dismantling the rights and protections of women and minority groups in their bumbling effort to get the man who could not be gotten. Are these extremists racists? Are they sexist? These become moot points when they are willing to directly assault those most different from them to get to a man they were unable to defeat in 2008 or 2012. Republicans have been unsuccessful in all of their attempts to beat the president at the ballot box, break him or get him to genuflect as they see fit. He’s taken them head-on and refused to bow or accept their disrespect. So great is the hatred of some against the president, that they are willing to keep the much-maligned Eric Holder in place rather than give the president a vote on his nominee. This strategy would make sense if it were a winning one, but in light of changing demographics, it trades logic for the instant gratification of trolling Lynch’s nomination with abortion fights and amnesty digs, believing they will only be riling the opposition, forgetting all the women, African Americans, Latinos, LGBT people and others caught in their wake of hate. Thankfully, there are Republicans who will find themselves on the right side of history when the history of the Lynch nomination is chronicled. Sen. Susan Collins (R-Maine), Sen. Jeff Flake (R-Ariz.), Sen. Lindsey Graham (R-S.C.), Sen. Orrin Hatch (R-Utah) and Sen. Mark Kirk (R-Ill.) have all indicated their support of Lynch, and when a vote on her nomination is finally scheduled, Lynch will ultimately be confirmed. On this day after Clinton announced her candidacy for president of the United States, the American public will begin to look for candidates who truly believe in equal opportunity for all Americans; who will advocate for the rights of children and women, who will uphold the nation’s civil rights laws, protect the voting rights of all Americans, prosecute police officers who wrongly harass, intimidate, profile or kill innocent people of color or otherwise, and who are willing to recognize that we are a nation of immigrants. As a result of this confluence of events, today may very well be the beginning of a Republican apocalypse; the day the most strident, extreme, right-wing members of the Republican Party sealed the party of Lincoln’s fate as a doomed, largely marginalized, regional party of mostly angry, Southern, white men destined to lose national elections for decades to come. A tide of populism will take hold throughout the nation as more and more Americans look to the women who will be their champions. Red states will eventually become battleground states, and then blue states. Loretta Lynch will eventually become the next attorney general of the United States and Hillary Clinton may very well be elected the next president of the United States. Today, the odds are in their favor. Michelle D. Bernard is a media commentator, political analyst, lawyer and president and CEO of the Bernard Center for Women, Politics & Public Policy. She is the author of Moving America Toward Justice: The Lawyers’ Committee for Civil Rights Under Law, 1963–2013 and Women’s Progress: How Women Are Wealthier, Healthier and More Independent Than Ever Before. Follow her on Twitter.